How do I talk about a book without gushing adjectives when my cheeks are glowing with writerly admiration and, in equal, turning green with writer envy? A hard call when I’ve just read what’s now up there as one of my favourite books ever. 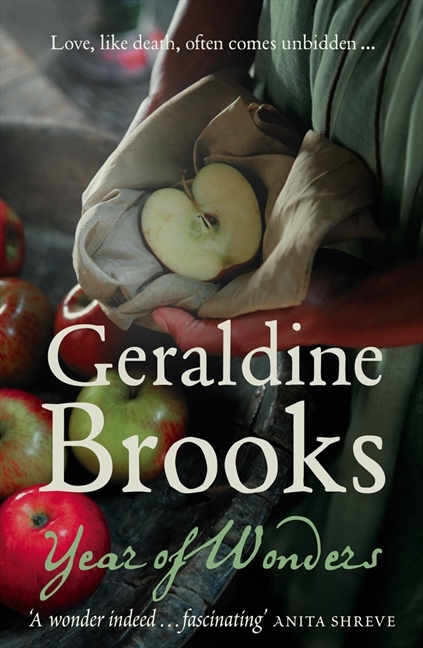 Geraldine Brooks Year of Wonders is an historical fiction tale, based on a true story, of a Derbyshire village who elect to quarantine themselves and their plague in the Spring of 1666 and spend a year cut off from the world. The writing is beautiful prose and evokes a strong sense of authenticity. For me, it’s a page turner that reached a very satisfying twist of an ending. However, I do need to add that I (along with others, it seems on Goodreads) did qualm over the epilogue, which took the story out of the world of the village to a happily ever after that I was not sure could or would have been possible for such a young, ignorant, unworldly girl of the day. However, I deeply admired the writing, the storytelling and the wonderful drawing together of the plot threads to a powerful and unexpected resolution that I won’t spoil here by telling. The voice captivated me and I found the book in my hands at every opportunity for the two days it took to read it. A “must read” for anyone who loves history and place. It’s fine to admire, even going a shade of green is fine, Chris. Remember though, with your own writing, to go with your heart. You’re absolutely right, Corinne. The power of story, at least for me as a writer, lies in the passion I have for it and for the characters. Still I hope one day my readers will read my novel with the same wonder and awe and be as transported as I was reading “Year of Wonders”. I loved the writing in this book, but the storyline at the end disappointed me. Up until then I was swept along. Me too. It was the first book in a long time that I couldn’t get back to fast enough. The very different mood, atmosphere and transition at the end (seemingly impossible for a girl of that time and of her socio/economic limitations) disappointed me too, despite wanting a happy ending for her. Pingback: Year of Wonders « From Hook to Book | Tommy found a real book.